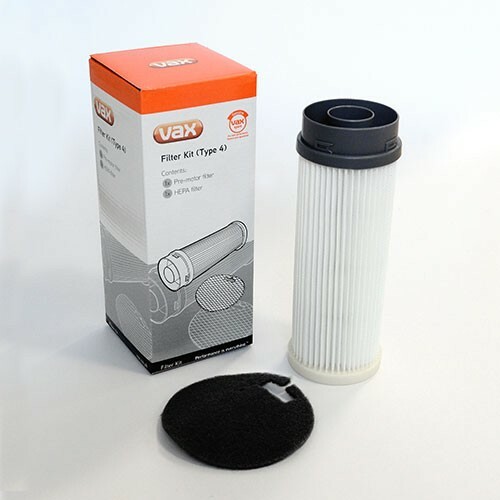 A replacement filter kit (Type 4) for your Vax vacuum cleaner. Contains 1 x Pre-Motor filter and 1 x HEPA Media filter. HEPA filters trap harmful particles such as pollen, pet dander, dust mites and smoke. Wash and replace filters regularly to maintain optimum performance. Suitable for VRS24B/R, Power max, V-1800U, Power 1, Power 2, Essentials, Centrix 3, Power VX2 and Power 1/2 Scent of Summer Upright models. Payment Plan of 4 x monthly instalments of £2.00 applies to Vax Filter Kit (Type 4) only, additional items to be paid in full at checkout.